At face value, “Pom Pom Victa” is a delightfully cheerful work. 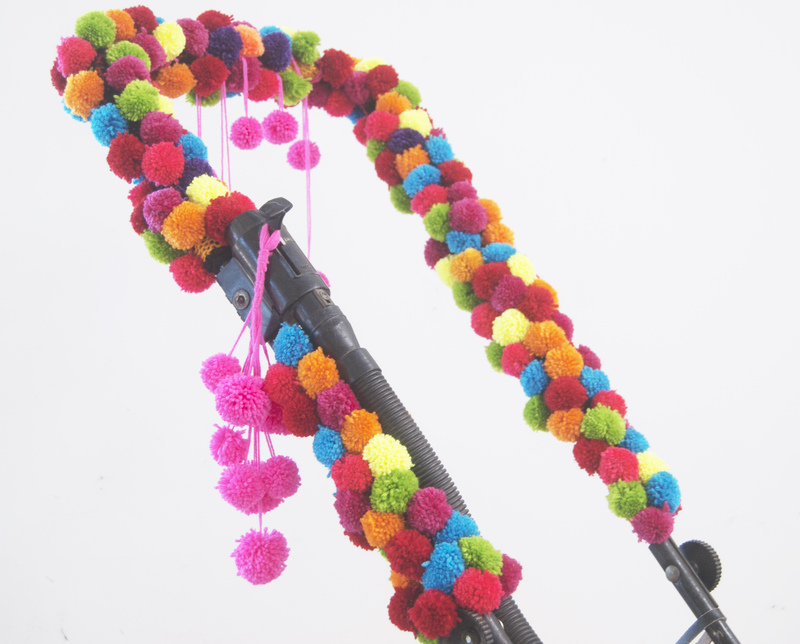 It is impossible not to smile when faced with hundreds of brightly coloured pom poms colonising a vintage “Victa” mower. However, below the surface there are a chorus of other narratives. By contrasting the “crafted” world and the “engineered” world, “Pom Pom Victa” succinctly shows us the difference between what men and women “do” with their hands. 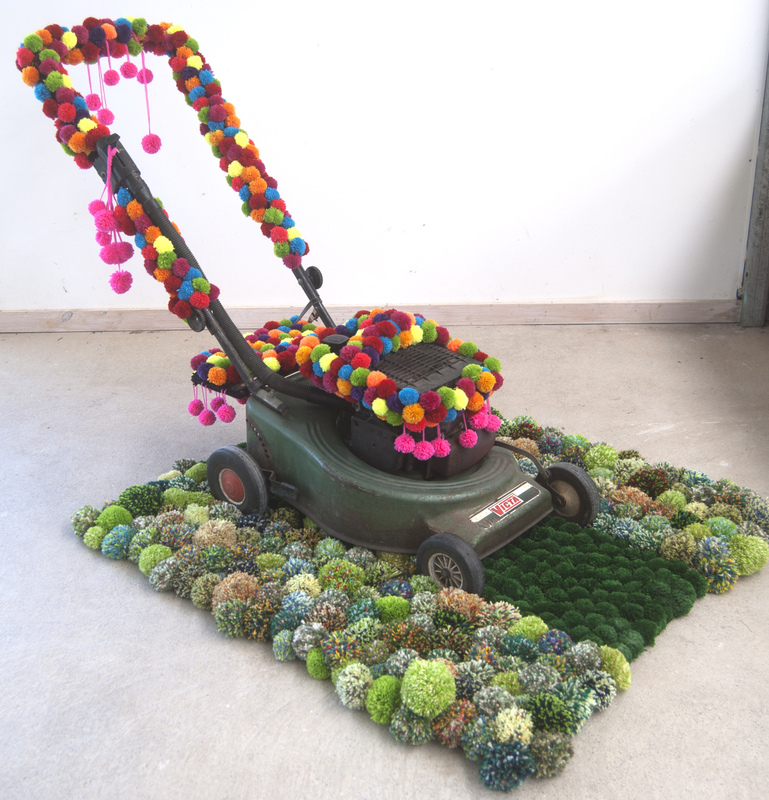 “Pom Pom Victa” challenges perceived notions of what is men’s work and what is women’s work; the practical male “Handyman” versus woman as the “Homemaker”. The soundtrack of Australian suburbia is dominated by the weekend symphony of droning mowers. In the same way that the development of elevators made it possible for the built environment to puncture the sky, it was the domestic mower, the “you beaut Victa” which made the suburban colonisation of the bush a reality. Grand expanses of bushland became tamed and tidy, transformed into neat little plots of impossibly perfect, high maintenance green. “Pom Pom Victa” operates within the framework of nostalgia, invoking the hey-day of Australian manufacturing and the Great Aussie Dream. Sentimentality clouds perception, which is why those marketing iconic Australian products like “Victa”, “Bonds” and “Holden” use nostalgia to manipulate consumer choices. Our proud history of innovation and manufacturing is all but dead. We have become a nation of consumers, not makers. Thinly veiled beneath the cheerful façade of conscious kitch, “Pom Pom Victa” provokes inconvenient questions. By Celeste Coucke and Helen Draper. Winner of the “ Peoples Choice ” Goulburn Regional Art Prize, November 2013. A big thank you to the Robertson Community Technology Centre for generously donating the Victa. It could not have happened to a more deserving mower! Congratulations on the inevitable recognition! I thoroughly enjoyed that little blog, it actually made me think I should mow my untamed lawn. Thanks Tracy. We are all pretty chuffed up here. Wouldn’t it be great if Pom Pom’s came in seed packets?